What is leadership and how do you define it? The summer issue of Inspired profiles different leaders and leadership models as Montefiore moves through a pivotal period in both its own history and a changing healthcare landscape. Whether leaders are born or made remains a mystery, but what we do find when reading Inspired is that Montefiore attracts leaders and is home to talented men and women who work hard every day to perfect the delivery of patient care. 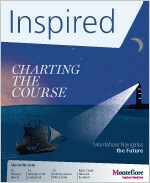 Visit www.montefiore.org/inspiredassociates to catch up on past issues to see who among your peers were featured, as well as watch new videos. Roy S. Chuck, MD, PhD, discusses the new Montefiore Laser and Eye Center in Scarsdale, NY. The new center is located at 495 Central Park Avenue in Scarsdale. Appointments can be made via the Montefiore Call Center at: 718-920-2020.